On 13 September, Tumi Morake compared white people after apartheid to playground bullies who eluded their deserved punishment. This follows shortly after the Spur debacle where the Spur restaurant group didn’t treat two customers who fought, the same based on their race. Statistics of the Institute of Race Relations shows that South Africans get along well and that we feel we need each other. The handling of cases where racial tension steps forward are still a challenge because everyone isn’t judged by the same yardstick. The perception that racism is a one-way street which harms only the majority, is simply wrong. Unfortunately, this perception is strengthened by a consistent pattern of double standards when handling race related issues. South Africans need a consistent yardstick whereby everyone can be judged. 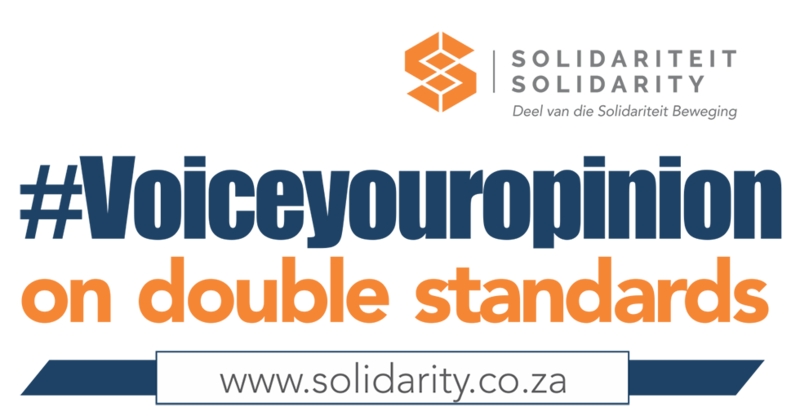 Solidarity is going to approach the Human Rights Commission (SAHRC) to ask for a public discussion as starting point, to try and find a solution for this issue. As input for the discussion, Solidarity is going to submit a qualitative research report at the HRC that will analyse various case studies and people’s reactions to it. Solidarity requests as many as possible South Africans to participate in the research. Explain in 100 words or less how the incident made you feel and how it was handled, solved or defused. This is totally unacceptable. How long do they want to play the blaming game?? Since day 1 on air Tumi has been abusing the platform calling someone a “doos” on air, and then because she is black she thinks she can say anything and get away with it. Dit is asof blankes onder die vergrootglas is en alles wat ons sê of doen word opgeblaas, maar anderskleuriges kan sê en doen net wat hulle wil en dit is reg so. It upset me because it is not my fault for being born white. I feel we have to apologise all the time for being white. I don’t have a radio but I read the news each day and feel threatened, bullied and oppressed by the anti-white bile spewed everywhere you look. I’m sick of it. This is my country too! Jacaranda gave Tumi the “platform”. I will not listen to their station again – because they allowed her to use it give her political opinion and because when I listen to the radio I expect to enjoy good music, hear interesting facts or short stories, & get news updates. Anything racist really ruins the day. It’s 23 years into democracy in SA it is time that SA moves on and people like Morake who grew up in a democratic SA should stop living in the past. I do not feel its fair that anyone whether black or white should have the power to instill their opinions on other people on live radio when no one can actually join into the conversation to also share their opinion. We have to live in shame that we are white, even if we are the youngest generation that had no part in the past. SA is all about pride and heritage for all races, except we are not allowed to have ANY heritage. The whole world is becoming so PC its almost a crime to be alive. Why should I be punished for something that happened before my time, so this means that the punishment for the sins of this generation of black rule will then be handed down to there children. And what type of punishment would pay the price would be acceptable for the sins of the past and what time frame? When will the laws on BBBEEE be lifted so that fair competitive businesses can take its place. For what period should the black majority receive free higher education, in all the countries in the world higher education after matric is paid for or a bursary is earned by a student that outperforms all the others. What price is enough? What would the expiry date be for BBBEEE? If there is no expiry date then my friend this that the government is doing now is apartheid. We live decent and honest lives in peace, but yet we are constantly branded otherwise. It’s seems that blacks feel they can say, act and speak with no repercussions. I am a young white individual who was 2 years old when apartheid ended. To be included in a past which you can’t relate and always have to feel apologetic for is affecting many of young white people’s characters to be proud who they are as opportunities/aspirations are taken away from young white individuals. Tumi’s comments have reminded young individuals that they are being punished for their grandfather’s decisions and that they need to suffer further. Message to Tumi: If a Bully has children, would it be fair to punish his children in school for his actions 23 years ago? I feel too often whites (and increasingly Indians) are expected to turn the other cheek to what are blatantly racist attacks, for the large part verbal. And social media seems a favoured platform for this one-sided racism, with black commentators being allowed to express grossly racist comments with no comeback allowed from those offended (who are most often ironically then accused of being racist themselves). There is a huge perception within the majority group in South Africa that only whites are racist, which is totally incorrect and unacceptable. The day they put Tumi on the morning show I stopped listening to Jacaranda. People are entitled to their opinions. Any form of racism that incites hate should be dealt with equally. The skewed perception that only white people are racist fuels the hatred and mistrust. We should all stand united and rather focus our energy on learning from the past, and building a better South Africa together, instead of keeping the hatred alive. White South Africans seem to feel so guilty about our past that we overreact in cases where there is conflict, by automatically singling out the white party to be guilty. Society also always blame all wrongs on the white settlers/apartheid architects/boers, etc. Simple – there is no place for double standards in our society. If we dare say a single word to a black person that they don’t like, hell will break lose. But if they slice our white farmers and their families and children into pieces and brutally murder them, then it is ok. If it was someone from another radio station that said anything like this about black people, she would have been without a job immediately.